When people around the country are asked whether they trust their state government to handle the state’s problems, how do you think they answer? Where would you guess they might be most distrustful and where least? 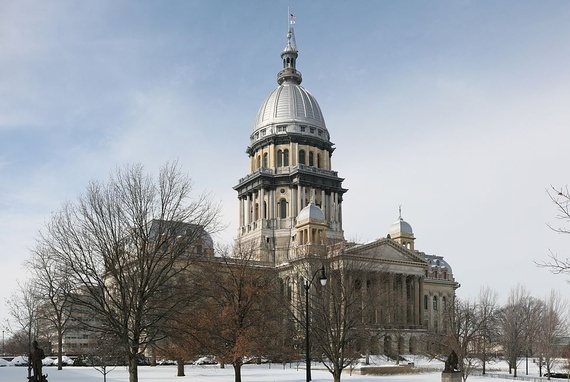 Illinois’ position at the bottom of the list in residents’ trust in state government is not surprising, given that its last two governors, Rod Blagojevich and George Ryan, were sentenced to jail for crimes committed while in office. Two prior Illinois governors from the 1960s and 1970s also went to jail. Yes, it isn’t hard to discern why Illinoisans might cast a suspicious eye on their state government. For expedience, let’s call that case closed. What about Rhode Island and Maine, next lowest on the trust index? Each only gets two-fifths of their residents to report much trust in state government. Is this also a matter of out-of-control corruption? People may think so, especially in the case of Rhode Island. (Think Buddy Cianci or the recent but still unexplained abrupt resignation of the speaker of the state’s house.) But as Katharine Seelye noted in Sunday’s New York Times, the perception of high levels of political corruption in Rhode Island is belied by studies showing that, at least as measured by convictions of public officials, it is actually among the least corrupt states. A more likely factor influencing the trustful feelings of Ocean State residents is a high unemployment rate. As Gallup states: “Healthy economies are generally associated with higher levels of trust in state government.” In 2013, Rhode Island still had, on average for the year, the second-highest unemployment rate in the country, at 9.5 percent. Only Nevada’s was worse. Why is trust in state governments eroding now, in the same way that trust in the federal government has been declining for most of the last half-century? Extremely low levels of job growth in Maine may also be the reason for that state’s low ranking on the trust index. The Maine Center for Economic Policy reportsthat “Maine ranks 49th among the 50 states and District of Columbia in total job growth since January 2011.” And some analysts point to actions by Maine Governor Paul LePage and the state legislature as being responsible for the stagnant economy there—and for the resultant low levels of trust. What’s up with the Westerners at the other end of the trust spectrum? The five states with the highest rates of trust in state government did, in fact, have impressively low rates of unemployment in the last quarter of 2013—North Dakota (2.6 percent), Wyoming (4.5 percent), Utah (4.3 percent), South Dakota (3.6 percent), and Nebraska (3.7 percent). So a healthy economy seems to be an important factor. And people in western, less-populated states generally seem to be more happy with their states, more inclined to think their states are among the best places to live. The effects of these feelings may cross over to attitudes toward state government. But absent sophisticated quantitative analyses involving much more data, any efforts to parse the differences among states on this subject are likely to hit dead ends. Let’s focus instead on the nationwide average of Americans’ attitudes about state government. Still, we’re left to ask: Why is Americans’ trust in their state governments eroding now, in the same way that their trust in the federal government has been decliningfor most of the last half-century? While one can offer explanations for such attitudes in individual states, it’s much harder to figure out what accounts for the nationwide declines depicted in the line graph above. Distrust of government is a leitmotif in American history. Wariness and suspicion of governmental authority are certainly not alien to the national experience. But another theme in Americans’ collective attitude toward government has been that we are more trustful of governments and politicians who are close to the people, while distrusting far-off elites. That may be changing, as attitudes toward state governments seem now in flux. Categories: American Government | Tags: state government, trust | Permalink.